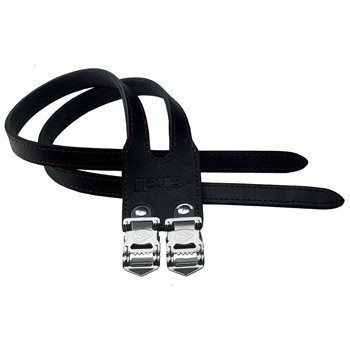 Cinelli's Binda strap, the original road racing toestrap. Using our previous experience in this field we produced a brand new proprietary buckle design which can withhold the fiercest pressure, whether it be that of a track acceleration or a sudden skid. Longevity and security is assured by the polylaminate layer between the leather which impedes stretching. Available in white or black with contrast colour red stitching.